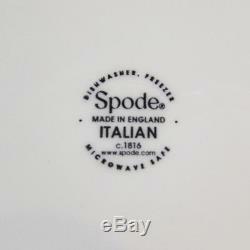 Set of Spode Blue Italian dinnerware. 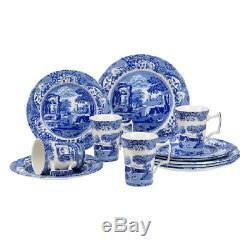 This set includes: 4 dinner plates, each measuring approx. 4 salad plates, each measuring approx. 4 cottage mugs, each measuring approx. 4 1/2" tall x 3 3/8" in diameter. Spode&###x2019;s extraordinary Blue Italian design is known for bringing effortless charm and timeless style to homes across the globe since 1816. Over 200 years later, at the center of those special family moments, elegant dinner parties and as essential accent pieces in the home, Blue Italian is adored as an iconic British design. With its finely detailed 18th century Imari Oriental border encompassing a stunning scene inspired by the Italian countryside this dinnerware is renowned for its strength and durability. This Fine Earthenware is Microwave, Freezer, and Dishwasher Safe. Founded in 1988, One4Silver has been serving our customers for more than 30 years. We do our best to provide as many details, pictures, and items specifics as possible about the products we offer. This listing is currently undergoing maintenance, we apologise for any inconvenience caused. 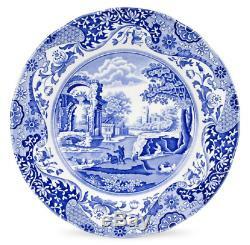 The item "Spode Blue Italian 12pc. Dinnerware Set" is in sale since Monday, March 5, 2018. This item is in the category "Pottery & Glass\Pottery & China\China & Dinnerware\Other China & Dinnerware". The seller is "one4silver" and is located in Akron, Ohio. This item can be shipped to United States, Canada, United Kingdom, Denmark, Romania, Slovakia, Bulgaria, Czech republic, Finland, Hungary, Latvia, Lithuania, Malta, Estonia, Australia, Greece, Portugal, Cyprus, Slovenia, Japan, China, Sweden, South Korea, Indonesia, Taiwan, South africa, Thailand, Belgium, France, Hong Kong, Ireland, Netherlands, Poland, Spain, Italy, Germany, Austria, Israel, Mexico, New Zealand, Philippines, Singapore, Switzerland, Norway, Saudi arabia, Ukraine, United arab emirates, Qatar, Kuwait, Bahrain, Croatia, Malaysia, Brazil, Chile, Colombia, Costa rica, Dominican republic, Panama, Trinidad and tobago, Guatemala, El salvador, Honduras, Jamaica, Antigua and barbuda, Aruba, Belize, Dominica, Grenada, Saint kitts and nevis, Saint lucia, Montserrat, Turks and caicos islands, Barbados, Bangladesh, Bermuda, Brunei darussalam, Bolivia, Ecuador, Egypt, French guiana, Guernsey, Gibraltar, Guadeloupe, Iceland, Jersey, Jordan, Cambodia, Cayman islands, Liechtenstein, Sri lanka, Luxembourg, Monaco, Macao, Martinique, Maldives, Nicaragua, Oman, Peru, Pakistan, Paraguay, Reunion.